IRELAND's women progressed to the quarter-finals of the Sevens World Cup in San Francisco , dumping England out in the process with a thrilling 19-14 win. Ashleigh Baxter crossed to open the scoring on two minutes, getting Anthony Eddy’s side off to the perfect start, but a converted effort from Emily Scarratt ensured England held a 7-5 interval lead. 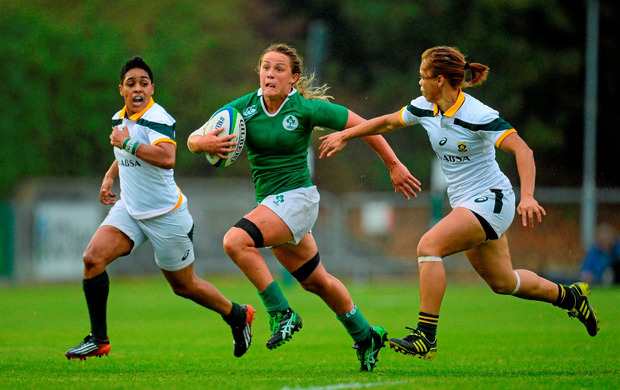 However, a second-half brace from try-scoring machine Amee Leigh Murphy Crowe put Ireland out of sight at 19-7 with two minutes to go, although England did get over the Irish line again at the death through Holly Aitchison. Ireland were due to do battle with New Zealand for a space in the final four early this morning. Ireland’s men were also in action late last night, in a last-16 tie against Chile. The men’s quarter-finals will be played tonight in San Franciso.